The Silver Surfer and the rise of the Graphic Novel (1978) | 'TAIN'T THE MEAT… IT'S THE HUMANITY! Between 1974 and 1979 Fireside Books published collections of reprinted comic book stories starring Marvel Comics characters and featuring introductions and commentaries by author Stan Lee. Widely considered to be the first trade paperbacks they proved such a success that 11 volumes saw print. There was also one more volume published from that series that featured a brand new, feature-length story created specifically to be published in book form, in a new format that would have a far reaching impact on the comic book industry. 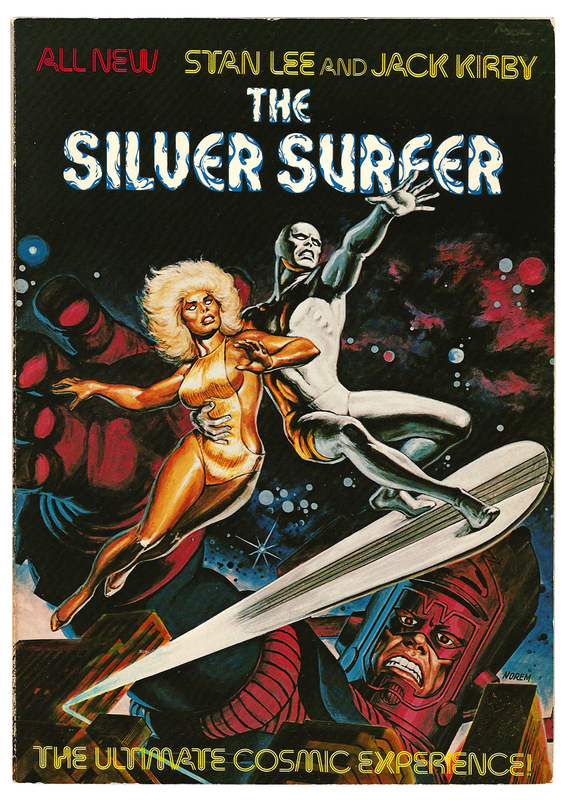 The Silver Surfer: The Ultimate Cosmic Experience, published in 1978, was one of the very first story’s to be published in this new format: the Graphic Novel. The term Graphic Novel causes some confusion and frequently the title is incorrectly applied, with most trade paperbacks being erroneously labelled as such, especially by high-street booksellers. Since most monthly comics are long running publications they feature ongoing stories, and although some major story lines are wrapped up within five or six issues other plot lines can continue for years, not unlike a TV soap opera. In the mid-to-late eighties, when collected comic book stories increased in popularity many publishers merely repackaged these single story arcs and labelled the book as a ‘graphic novel’. Strictly speaking a Graphic Novel is defined as a self contained, finite story with a definite beginning, middle and end. Some are published in a single volume – Craig Thompson‘s Blankets or J. Michael Straczynski‘s and Shane Davis‘ Superman: Earth One, for example – while most are published as a limited run that is then collected into one or two volumes. I doubt anyone would argue against Alan Moore‘s and Dave Gibbon‘s groundbreaking Watchmen being categorised as a Graphic Novel despite it being originally published as 12 individual comics. 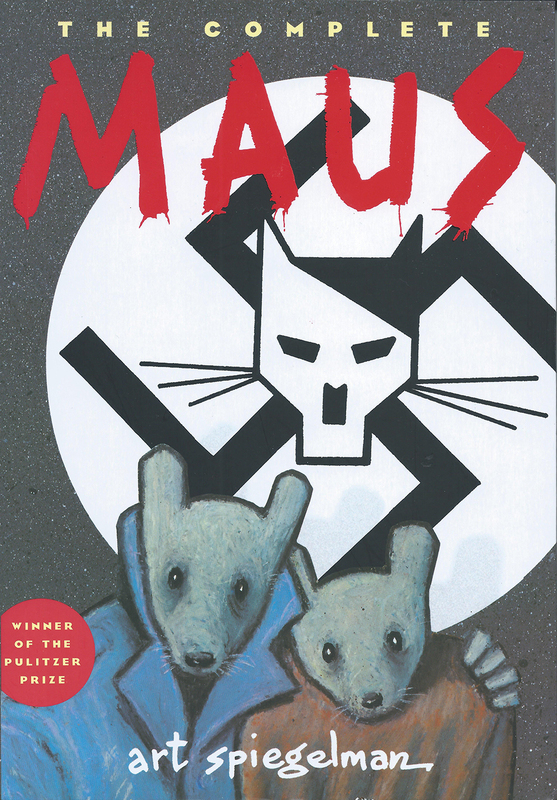 The same goes for Art Spiegelman‘s Pulitzer Prize winning Maus, which was originally serialised throughout the Eighties before being collected and published in two volumes in 1991. 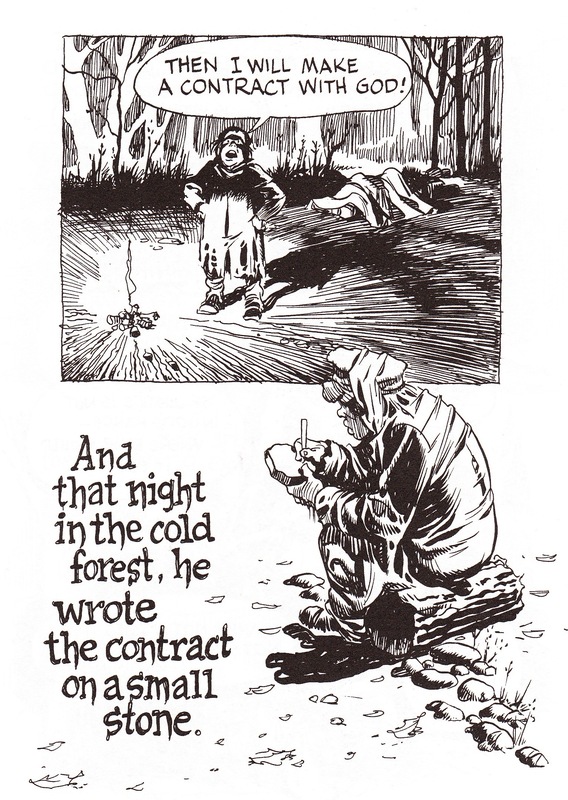 A Contact with God by Will Eisner (page 18). Although this new format came to prominence in the late Seventies, it’s disputed which book can lay claim to being the very first Graphic Novel. Arnold Drake, Leslie Waller and Matt Baker‘s 128 page It Rhymes with Lust from 1950 may have been labelled as a ‘Picture Novel’ but it displayed all the signs of a Graphic Novel; Gil Kane‘s and Archie Goodwin‘s Blackmark from 1971 retroactively claimed the title a few years after its publication; Richard Corben‘s Bloodstar from 1976 used the term in its introduction, as did Jim Steranko‘s Chandler: Red Tide from the same year. And even though it was published two years later Will Eisner‘s A Contact with God from 1978 was the first Graphic Novel to achieve popularity with the general public and therefore deserves special notice. 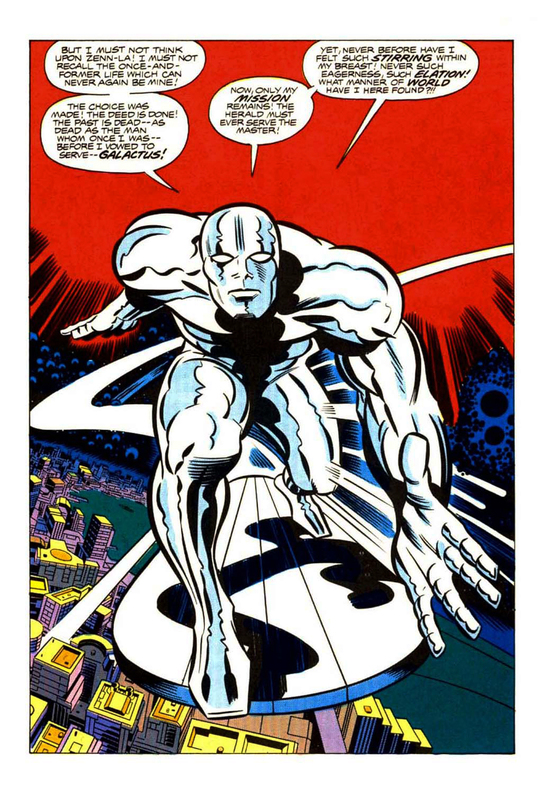 The Silver Surfer: The Ultimate Cosmic Experience may not have been the first Graphic Novel but it was the first from Marvel, although its genesis was somewhat unusual. In late 1976 Stan Lee and Marvel were approached by producer Lee Kramer with a proposition for a rock opera movie based on The Silver Surfer. Since the film rights to The Fantastic Four had already been optioned to another film company, the story couldn’t feature the FF or any other Marvel characters apart from the Surfer and Galactus. Kramer proposed that Marvel first create a comic on which the movie could, hopefully, be later based. Kramer also requested the inclusion of a strong female character so if the film was green-lit his then girlfriend Olivia Newton-John could play the role. Author Lee and artist Jack Kirby would also retain copyright of the story so if the film was made both would benefit financially. Although there were rumours that body builder and three-time Mr. Olympia Frank Zane had been cast as the Surfer, and a one sheet poster for the film was produced (which I clearly remember seeing in a movie magazine from that time), ultimately financing fell through and the film was never made. The Silver Surfer: The Ultimate Cosmic Experience, page 67. Although the story that featured in The Silver Surfer: The Ultimate Cosmic Experience was new the themes therein will be very familiar to regular readers of The Silver Surfer and The Fantastic Four comic books. The Surfer, herald of the planet-consuming Galactus, has been sent to Earth to scout the planet as a suitable power source for his master. But once he arrives he recognises humanity’s potential for greatness and defies Galactus, eventually driving him off and incurring his masters wraith. Galactus abandons the Earth and the Surfer, but plots to lure back his herald. He creates a female companion for the Surfer, the gold-skinned Ardina, who attempts to seduce the herald but instead falls in love with him, and eventually sacrifices herself to save him. Throughout the story the Surfer attempts to bond with the people of Earth but is instead shunned by nearly all those he encounters – their memories of him saving them having been wiped by Galactus. Eventually the Surfer realises that the only way to ensure the Earth’s survival is to return to Galactus and the book ends as it starts, with the image of Galactus’ giant fist enclosed around the Surfer. During the character’s publication history prior to this book Lee had hinted at religious overtones in the Surfer’s story – in this book those connotations are overt: Galactus is God; the Surfer is Christ/Adam, Ardina is Eve, and the people of earth are the fearful masses who reject him. Ultimately the Surfer can only ‘save’ humanity by returning to the ‘god’ that spawned him. It’s a pretty bold message from Lee and one that works… well, some of the time. In most cases Lee successfully hinted at the divine nature of the Surfer and his effect on mankind, illustrated by the African tribe who worship the Surfer as a new deity. Other times Lee is a little too heavy handed, especially when the Surfer attempts to fraternise with humans — he is rebuffed and hounded so ceaselessly that after a while it just becomes tiresome. Still, Lee clearly recognised that the audience for the book were likely to be more mature than the usual, younger, comic book reader and so he aimed the story a little higher, an admirable gesture. Although the book would prove be the last collaboration between creative partners Lee and Kirby it was not a happy one, and the roots of that discord go back to the previous decade. The character was originally created solely by Kirby (appearing first in The Fantastic Four issue #48, March 1966) and he felt, with some justification, that in the succeeding years Lee had appropriated the Surfer from him. Lee has made no secret of his admiration and affinity for the character and had previously taken a special interest in his development. 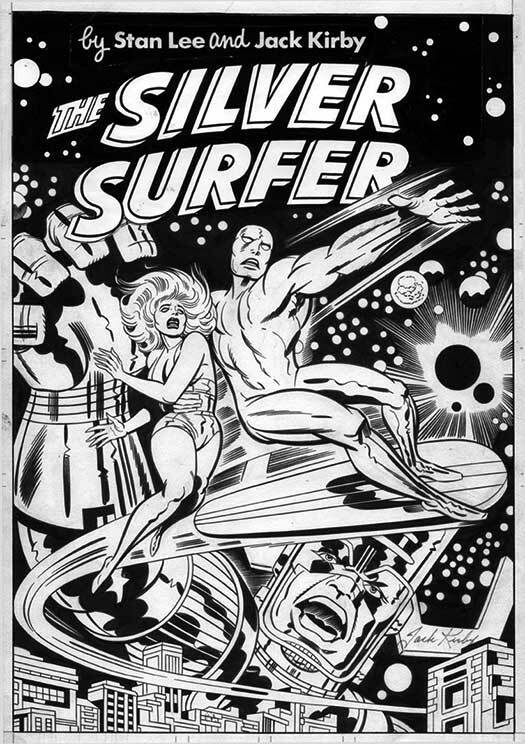 Matters were made worse when the Surfer was given his own monthly series in 1968 and Lee gave the job of drawing the title not to Kirby but to artist John Buscema. Lee also compounded the insult by giving the character a backstory different to the one Kirby had originally imagined – Kirby created the character as a amoral being of pure energy while Lee postulated that the Surfer was a noble alien who had sacrificed his freedom to save his planet. Two years later Kirby quit Marvel to work for rival publisher DC, an event that sent shockwaves through the industry, and although stalled contract negotiations were Kirby’s main motivation for heading out the door, the anger he felt over the lack of recognition for his creative efforts certainly put a spring in his step. After a four year stint at DC, where he created some of the publisher’s most unique and enduring characters – which sadly at the time didn’t sell – a dissatisfied Kirby returned to Marvel for three years before leaving the industry for good in 1978 (during the Eighties he worked on a few projects for some of the smaller publishers but on the whole he stayed away). Before he was allowed to leave he was given the Surfer book and apparently viewed it as just another contractual assignment, one to be completed before he could leave the company (ironically the contract he’d fought so hard for now stalled his departure). 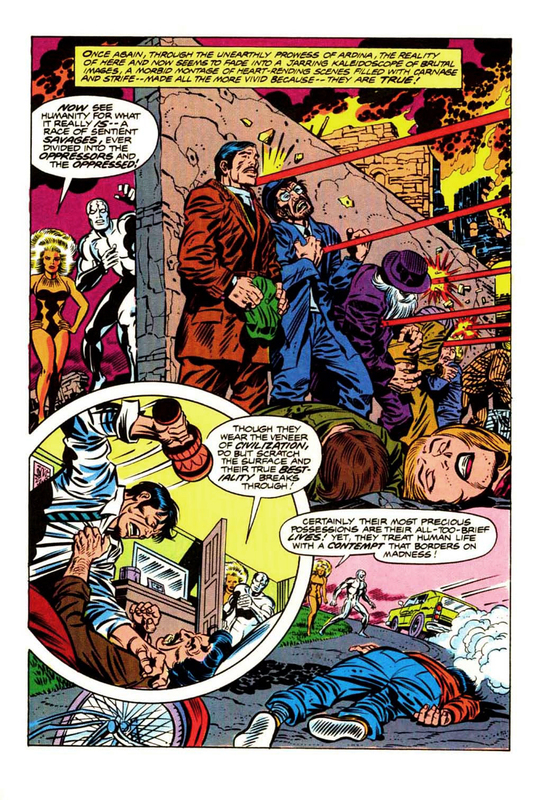 Despite Kirby submitting artwork with detailed plot breakdown’s Lee demanded changes, even going as far as to substitute a panel on page 61 for one drawn by Buscema (see right) – a decision that couldn’t have failed to anger Kirby. To make matters worse Kirby’s cover for the book was rejected and established paperback cover artist Earl Norem was commissioned to paint a version based on Kirby’s pencils. Kirby’s original artwork for the cover was rejected. However, if Kirby did view the book as ‘just another job’ it certainly wasn’t reflected in his work, which featured some of the strongest of his career. 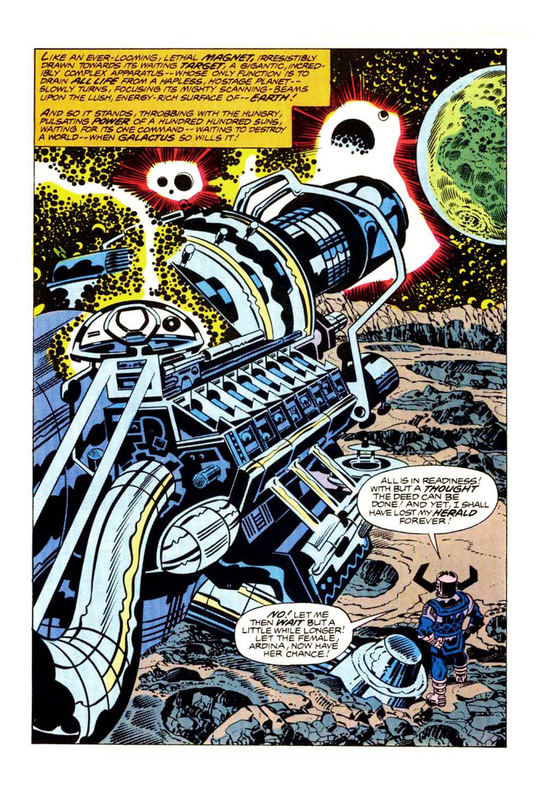 Out of all the varied comic artists who have worked in the medium Kirby’s style changed the most over his 50 year career, and to my eye the zenith of that evolution was the work he did for Marvel in the mid-Seventies. He was always a confident artist but during that period his work had an incredibly powerful and boldly graphic sense of drama and action – his work on Captain America particularly warrants special attention, as does his work on this book, and his depictions of interstellar space, giant alien machines and other awesome cosmic events are peerless. 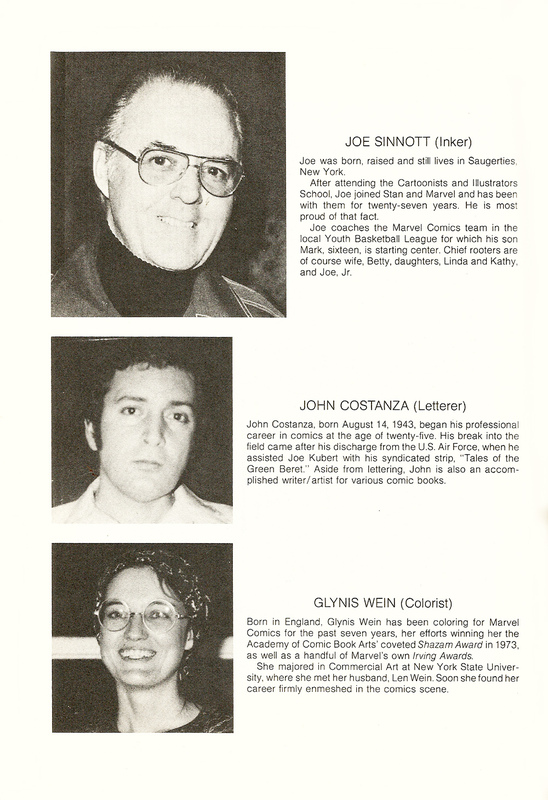 Page 122 featured biographies of Sinnot, Costanza and Wein. The book was clearly meant to be a prestigious one and that’s self-evident in its presentation: Lee introduced the story with a four page preface; there are quotes from the Rubaiyat of Omar Khayyam and Tamam Shud at the beginning and end respectively, and the book concludes with biographies and photos of Lee and Kirby while Joe Sinnott (the inker), John Costanza (letterer), and Glynis Wein (colorist) are also acknowledged. 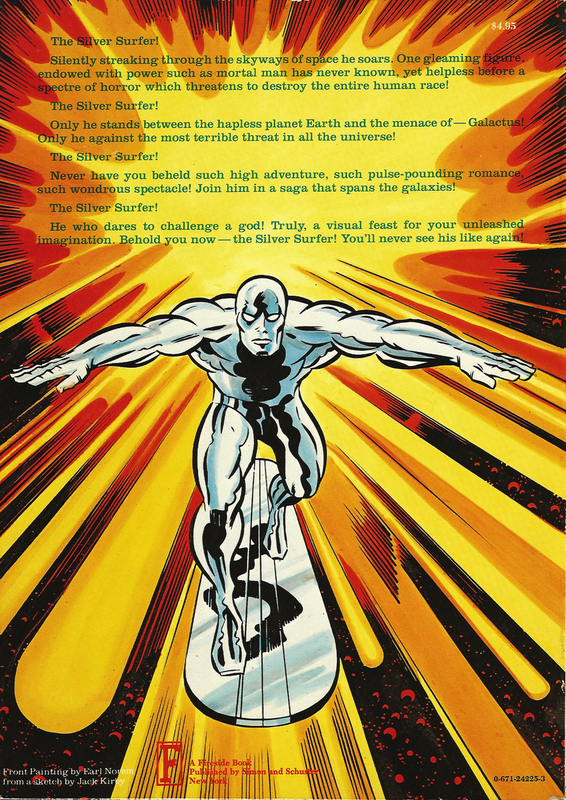 Although now out of print, The Silver Surfer: The Ultimate Cosmic Experience is well worth seeking out — the extra attention lavished on the book, as well as its celebrity as one of the first Graphic Novels, makes it an attractive prospect for collectors. And I like the cover – Fireside clearly wanted the book to appeal to a more mature audience and Kirby’s original cover probably would have deterred readers who wouldn’t normally read comics. The book is also worth tracking down as it was the last creative alliance between two of comics’ greatest legends. Although the Fireside/Marvel partnership ran to 11 trade paperbacks and one Graphic Novel, there were other collaborations between the two publishers that featured publications as diverse as puzzle books, a fitness book and even a cookbook. I’ve looked at them in my detail in my Afterword to this series.